Universally Unique IDentifiers (UUIDs) are unique across every database – globally! Easy merging of entries from different databases. No conflicting primary keys anymore. Easy replication and synchronization of distributed databases. We can generate UUIDs everywhere. So there is no round trip to the database necessary, because we can generate UUIDs in the application layer. 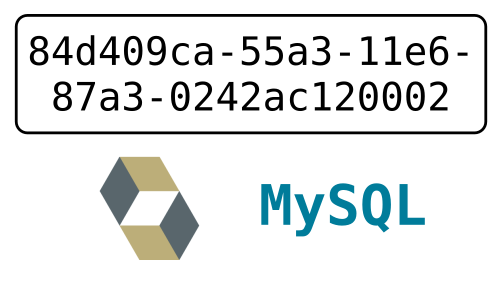 This also simplifies tests and allows easy batch inserts of entities referencing each other. Auto incremental IDs are guessable, which can lead to security issues (e.g. playing around with the ID parameter in the URL and scrape all content). UUIDs allow client-side generation and easy replication and merge across distributed databases. UUIDs increase the required size for the value and the index. A single UUID needs 16 bytes. Contrarily, a normal int key only needs 4 bytes. They make ad-hoc queries more clumsy (see below). UUIDs in REST resources increase the payload size. It’s not a good idea to use VARCHAR(36) as a column type for UUIDs. Instead, we should use a BINARY(16) column. This minimizes the required value size (less bytes, no dashes) and index size. However, this makes queries a little bit more complicated. With uuid() we can generate UUIDs. Please mind, that uuid() returns a UUID with dashes. We have to remove them with replace() in order to insert an entry. Moreover, we have to use unhex() which converts a hexadecimal (human-readable) UUID to its binary representation. Now it fits into a BINARY(16) column. Use hex() to convert the UUID bytes back to their hexadecimal representation. Let’s query for a certain UUID using unhex(). On GitHub I created a simple Spring Boot + Hibernate/JPA project to demonstrate UUIDs in action.